Chilled dies are necessary to avoid sticking and only extra-low temperature models perform satisfactorily. 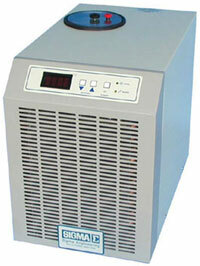 SIGMA die chillers are specially designed for ease of use and reliability. Units operate on ordinary single-phase voltage and require no water plumbing. Accuracy is +/- 1/2oc. Temperature range is -40 to 35oc. The models described in the specifications are for use with soap dies. Other units are also available for process water cooling in production machinery. Please inquire. All SIGMA plodders, both laboratory and production, are available with built-in chillers for recirculation of cooling water.